Saturday was such a fun day! Just like every year, I went to shop for Lunch at Lilly. Over the many years I've participated in this exciting event, things have changed a bit. I remember when it was called Lunch WITH Lilly! Lucky winners actually got to go to the Pink Palace for lunch. Another year, I won a print for participating in the promotion. But every year is a great experience. This year, I organized a lunch for some Lilly Lovers in Maryland. We ate at a new restaurant called CRAVE. I loved the food and had trouble deciding what to order, but ended up getting the baked chicken. Sweet pineapple blended with jalapeno jelly for a delicious flavor paired with coconut jasmine rice. Yum! Everyone looked so beautifully colorful in their Lilly at lunch; all the servers commented that they knew where we were headed after our meal. I made little goodie bags with some treats for the guests, with some sweet treats including some personalized items that I made in the Maryland print and some Lilly. The party started before I entered the store. A stunning dress made entirely of flowers adorned the corridor where the Lilly Pulitzer store stands. It reminds me of a flamenco dress, with the flower in the model's hair. I nicknamed her Lola. Life is a party and the atmosphere inside the store radiated fun. All of the lovely employees were wearing the First Impression print and they looked fantastic. Pineapples and yellow were the party theme with gold pineapples holding helium filled balloons and cookies that were (almost!) too pretty to eat. The store buzzed with activity and the mood was light and fun with everyone thinking about spring parties and Easter dresses. I sipped some pineapple punch, available in spiked and virgin varieties, while I selected my favorites from the latest spring deliveries. A DJ kept the best music playing while everyone shopped. I ended up finding lots of goodies on Saturday's Lunch at Lilly. Here's a sampling of what I brought home with me. The Elsa top is so perfect! Since I've shopped quite a bit already for Easter and my nephew's welcome shower, Natalia and Alexia were the winners this time. 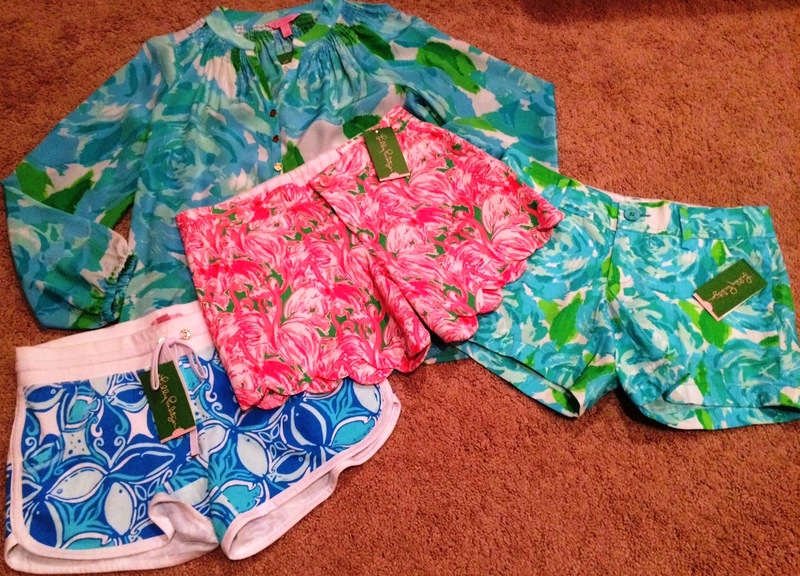 They LOVE Lilly Pulitzer shorts. The Buttercup shorts are dressy, but casual and both girls love the flamingo print. All of a sudden, the girls like to match each other from time to time again, so I picked up another pair of Callahan shorts. The Chrissy Beach shorts are perfect to wear over a bathing suit or for lounging around the pool. There's another dress that Alexia got, too, but I can't reveal that one quite yet because she's going to wear it to her 8th grade dance.